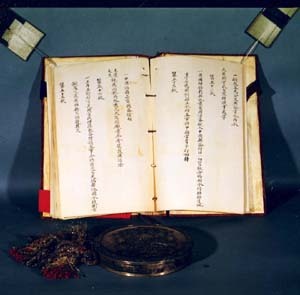 Article 51 of the Chinese text of the 1858 Treaty of Tianjin. Courtesy of the National Palace Museum, Taiwan, ROC. You are looking at images of the original handwritten text of Article 51 of the 1858 Treaty of Tianjin, both the English (in the INTRODUCTION) and Chinese texts. The treaty was written in 1858 during the second Opium War in order to enable the British to establish foreign government representation in China’s capitol. These objects currently reside in the National Palace Museum in Taiwan. In 1858, after lengthy negotiations, multiple copies were handwritten on sheets of paper, which were then bound in velvet-covered leather. Identical copies were retained both by the British and the Chinese governments. Close observation of the details reveals that the handwriting, in both cases, uses a similar tone of ink and good-quality calligraphy. From the physical treaty itself, you can learn much that is overlooked in most textbook accounts of the treaty. As you can see, the treaty was handwritten on heavy, high-quality paper, and bound in velvet with elaborate tassels to underscore its importance as a document binding two great nations. Victoria, by the Grace of God, Queen of the United Kingdom of Great Britain and Ireland, Defender of the Faith. . .